Come to beautiful Branson, Missouri September 23-27, 2010 and piece and patch away a 4 day weekend with instructors Kathy Kansier and Pam Buda! Enjoy 2 full days of quilting instruction, a lecture from Pam Buda “Secrets of a Professional quilter” and a day at the Springfield Quilt Show! This retreat also includes Breakfast and Lunch each day, a welcome reception, 4 nights lodging, door prizes, around the clock access to quilting rooms and more! This one is filling fast so plan to join us and register today at www.bransonquilting.com or call 417 889-8040. Sew, What Do You Want For Christmas Quilt Retreat! Join us in Branson, Missouri November 18-22 , 2010 for a terrific Christmas Quilting Retreat. Learn how to make a gorgeous table runner, a beautiful wall hanging and a fantastic tree skirt. Give as gifts or keep for yourself! Instructors for this retreat are Kathy Kansier, Carolyn Snyder and Barbara Engler. You will enjoy 3 full days of instruction, breakfast & lunch each day, a welcome reception, door prizes, 4 nights lodging, around the clock access to our quilting rooms and more! Book today to ensure your spot! Following the 50-year celebration of the” live music show capital” last year, Branson still has a lot to sing about with even more celebrations this year including the 50th birthday of the award-winning Silver Dollar City theme park and the 50th year of the Shepherd of the Hills outdoor drama. And sing about it, they do. The song, Listen to the Music, recorded by the Doobie Brothers in 1972, has become the theme song for Branson and many will recognize this familiar tune as the music playing behind the Branson TV commercials, currently seen on national cable. To promote the variety and live music bonanza one can find in Branson, from The Legend of Kung Fu, with a cast of over 50 performers, to Neal McCoy and Buck Trent at the new Clay Cooper Theatre, Joseph Hall in “A Tribute to Elvis,” and the award-winning vocal band The Cat’s Pajamas and so much more, Branson Landing, the 95-acre retail entertainment destination with over 100 shops and restaurants, decided to add a new show to their $7.5 million fountain spectacular. And now, added to the fountain show lineup, guests can also “Listen to the Music” at Branson Landing. From all of us in Branson, we invite everyone to take the time to celebrate with your family and friends this year in Branson. For more information on Branson Landing, please visit www.bransonlanding.com. Don Williams, with hits including Good Ole Boys Like Me, I Believe In You, Love Is On A Roll, Some Broken Hearts Never Mend and Tulsa Time, has always had a knack for finding songs that speak directly to people’s hearts. All together he has 17 – #1 and 42 – Top 10 hits. Such a career has made Don Williams a 2010 inductee to The Country Music Hall of Fame. That honor, accompanied by an overwhelming demand by fans around the world, has prompted Williams to come out of retirement for a few select concerts this fall. One of those very special shows will be at Tri-Lakes Center in Branson on Saturday October 9 at 7:00pm. When he retired four years ago Williams had no plans to take the stage again. It was time to enjoy the fruits of his labor, and when he felt like it he would still record new material. That changed this year with the announcement that Williams would be entering the Country Music Hall of Fame. His fans kept asking for the opportunity to hear his amazing voice live on stage one more time. As an artist who always appreciated the tremendous support of his fans, Williams decided to perform a handful of shows this fall to say “thank you” for his incredible career. More information about this historic Branson show on Saturday October 9 at Tri-Lakes Center is available at www.upcloseconcerts.com. Tickets are on sale at the Tri-Lakes Center box office or by calling (417) 336-0219. Step back in time to good old fashion fun and ice cream at our new vintage Airstream named Frosty’s! You’ll find great ways to cool down including hand dipped ice cream, floats, frozen candy bars, and frozen chocolate bananas. If you’re looking for a refreshing adult beverage check out our lemonade made with you in mind. You can find Frosty and all his cool treats on the lawn located in front of the Swimmin’ Hole. Frosty’s is opened daily from 12pm-9pm and open to the general public as well as on property guests. Call 417-339-7101 for more information. BRANSON LANDING’S 3RD ANNUAL “LIBERTY LIGHT UP” FIREWORKS, CONCERTS & MORE! BRANSON, MO, JUNE 28, 2010 – America’s independence will be celebrated a day early on Saturday, July 3rd at Branson Landing—Branson’s premiere shopping, dining and entertainment destination located in Historic Downtown Branson on Lake Taneycomo. Everyone is invited to “Light Up” their Independence Day weekend celebration on Saturday evening, July 3rd with a fantastic outdoor concert extravaganza, featuring “A Tribute to Journey” starring the ever talented and unforgettable band, Chain-Reaction. Back by popular demand, Chain-Reaction takes the stage at 8PM and promises to delight audiences of all ages as their famous melodies take listeners on a spectacular journey back to the ‘80’s with performances of timeless Journey hits like “Separate Ways,” “Don’t Stop Believin,” “Faithfully,” “Open Arms” and so many more. The “Liberty Light Up” display will be held near the Landing’s signature Fountains and this one-of-a-kind, up close, choreographed spectacle promises to amaze all ages, as it builds to an awe inspiring Gateway Fireworks Signature Grand Finale – not soon to be forgotten,” concluded Scholten. Branson Landing’s Liberty Light Up celebration not only honors America’s independence, but serves as the official kick-off to Branson Landing’s Summer Concert Series—featuring LIVE performances in front of the $7.5 million Water & Fire Spectacular Fountain Show in Branson Landing’s Town Square. For more information on the 2010 Summer Concert Series and Special Events, visit www.bransonlanding.com. Note: Concerts and Special Events are subject to change due to weather and unforeseen circumstances. For a complete list of shopping and dining options, as well as the entertainment and event schedule, visit www.bransonlanding.com or www.bransonlandingshops.com. State Representative Nita Jane Ayres announces the endorsement of former State Treasurer, Sarah Steelman. “I am proud to throw my support behind Nita Jane as she continues to be a strong conservative leader in Jefferson City”, Steelman said. “The people are tired of the government interfering in their lives, small businesses, and personal property and Nita Jane has a proven track record of voting in favor of the people in her district”. Steelman is known best for starting the program Terror-Free Investing during her tenure as State Treasurer. The program provides oversight of state funds to ensure that Missouri’s tax-payer dollars are not sent to countries like Iraq, Iran, Sudan and other terror-sponsoring nations. “I am honored to have the support of Sarah”, said Ayres. “Sarah has been a strong pro-business, pro-life and pro-family advocate for the people of this state and has inspired many across Missouri and our nation as she continues to work tirelessly for our conservative principles”. Steelman’s first public appearance for Ayres will be Monday, June 28th at 5:30pm for a Nita Jane Ayres campaign rally. Ayres has also earned the exclusive endorsement of the Missouri Right to Life. Ayres is one of three Republican candidates for State Representative for the 62nd District of the Missouri House of Representatives. The 62nd District includes parts of Stone and Taney Counties. Ayres was elected as State Representative in a Special Election this past February. June 28 – Monday, 5:30 p.m. Traveling South on Hwy 65 approximately one mile from the Hollister interchange, turn left on Maple Street/Branson Creek Blvd. Continue approximately 5 miles (Branson Creek Blvd. becomes Branson Airport Blvd.) and park in the Short Term lot. Please bring in your parking ticket for validation. In 2007, Bobby was in Iraq and assigned to relieve another soldier as a Humvee driver on April 7, 2007. On that day, his very first day in his new role, Bobby was driving a Humvee when it hit a road-side bomb. The bomb totally destroyed the Hummer and killed the other men in the vehicle. Bobby’s clothing caught fire. Sergeant First Class Bryant Fowler, the soldier Bobby was relieving, pulled Bobby out of the truck, doused the fire that was consuming him and began life saving procedures. Bobby was flown back to the States, and since April 7, 2007, he has had to endure 41 plastic surgeries to restructure his torso, head and arms. The plastic surgery failed on one arm and it had to be amputated. Thankfully, where there was only bone, the surgeons were able to put down new skin tissue. They recently did surgery on his left eye, which he also lost, so it would appear more normal and they have begun reconstructive work on his mouth. The surgeons gave Bobby less than a 50-50 chance of pulling through those initial surgeries, but he surprised them all by surviving. Bobbi is to be honored and to throw in the first pitch in a minor league Springfield Cardinal home game on the evening of June 25. As if that wasn’t enough, the soldier who pulled Bobby from the burning Humvee and applied life-saving procedures (Sergeant First Class Bryant Fowler) now lives and works as head Drill Sergeant at Ft. Leonard Wood. Bryant and Bobby have not seen each other since the accident in 2007. On Friday, June 25, at the start of the game, SFC Fowler will make a surprise entrance onto the field, seeing Bobby for the first time in more than three years and joining him as he throws the game’s first pitch. I have to tell you, it brings a tear to my eye, just thinking about it. My understanding is that the Stadium is sold out in anticipation. More than 7,300 people will be in attendance. The Our House Foundation (the group that I have been working with) and the Springfield Cardinals will be honoring both men at the Cardinals game that night. 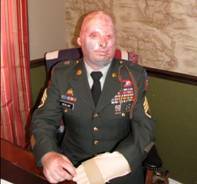 Given the severity of Bobby’s injuries and the many many surgeries he has endured, it is very important that we do all we can to give this special soldier the special care he so needs (and deserves). Join us at Big Cedar Lodge for the Independence Day Patriotic Picnic event Sunday, July 4th, 2010 from 12:00 pm – 6:00 pm. This open event to the public and Big Cedar Lodge guests includes complimentary picnic games and activities such as Sack Races, Water Balloon Toss, Pie Eating Contests, Face Painting and more. Stay until dusk and Big Cedar Lodge will light up the night sky with a spectacular complimentary fireworks display overlooking Table Rock Lake that is sure to be enjoyed by all.